I had dinner with William Deresiewicz, author of Excellent Sheep: The Miseducation of the American Elite and the Way to a Meaningful Life, (along with a group of students) before his lecture at Reed last week and we had a lovely conversation. Nice guy, very smart, heart in the right place. Based upon his lecture and his article in the New Republic, “Don’t Send Your Kid to the Ivy League—The nation’s top colleges are turning our kids into zombies,” I have three bones to pick. First, his lumping together Reed with Sewanee, Mt. Holyoke, Kenyon and Wesleyan is, without putting too fine a point on it, not very helpful. I think it shows a profound misunderstanding of Reed. When I mentioned this possibility to him, he didn’t seem especially interested. If one is thinking about models for how a truly serious and student-oriented undergraduate program ought to look, you’d think a serious engagement with Reed might be useful—perhaps even essential. Second, I think he largely misses the point of Harvard, Yale, Princeton, and the others. Not that they need my defense, but his criticism seems at once true and irrelevant. I doubt that many people really believe those institutions exist to provide great undergraduate teaching. Rather, they exist primarily to create knowledge—e.g., Nobel Prize winners and their equivalents in other fields—and, as such, they play a crucial and essential role in society. As an institutional matter, that role is deeply incompatible with terrific undergraduate teaching (if nothing else, we at Reed work much too hard on our teaching to win Nobel prizes), but so what? If you’re an undergraduate at, say, Harvard, the benefits that you will reap in terms of prestige, contacts with other enormously talented people, occasional opportunities to rub elbows with and perhaps learn some things from one or two world-class scholars—these are hardly trivial. And if that’s what an undergraduate wants, who’s to argue? It wouldn’t be my choice, but Reed isn’t for everybody. Considering the enormous quantities of time, energy, money, and anguish that are invested in higher education in this country, you might imagine that we'd have more hard data about how well it works. Yet research on the true purpose of a college education--whether it produces an educated person--is surprisingly sparse. 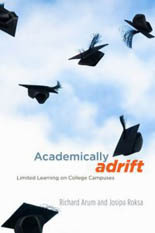 A major new book on the subject--Academically Adrift, by Richard Arum and Josipa Roksa--presents plenty of data, and the conclusions aren't pretty. Approximately 45% of the undergraduates surveyed showed no improvement in their overall analytical competence after two years of college, and 36% showed no improvement after four years of college. "Large numbers of U.S. college students can be accurately described as academically adrift. 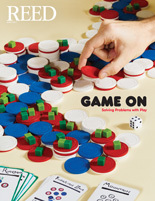 They might graduate, but they are failing to develop the higher-order cognitive skills that it is widely assumed college students should master," the authors write. Continue reading Does College Work?